The drive dynamic of this vehicle is extremely powerful. The electric motor under the hood is what makes this vehicle a car to be envied. 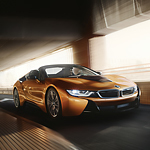 A TwinPower Turbo gas engine adds dynamic horsepower to give the BMW i8 Coupe excellent speed. A lightweight carbon fiber reinforced plastic construction ultimately helps enhance the aerodynamic excellence of the vehicle.